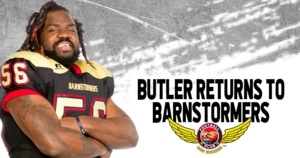 Butler (6-3, 290, Louisville) joins the Iowa Barnstormers for his third season with the team and his fourth season in the Indoor Football League (IFL). In 2018, Butler appeared in 13 regular season games with the Barnstormers where he collected 26.5 total tackles, nine tackles for loss, one pass breakup, and one sack. Butler also collected one touchdown reception. Appearing in both post-season games, Butler played a crucial role in the team’s United Bowl Championship victory.